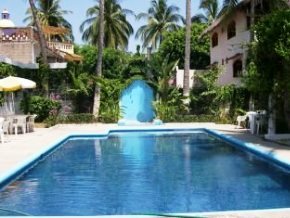 This hotel is a tropical oasis set in a refreshing combination of garden beauty and quiet atmosphere, located in the heart of the charming Mexican small town of Bucerias, Nayarit, Mexico, just 15 minutes from the Puerto Vallarta International airport. 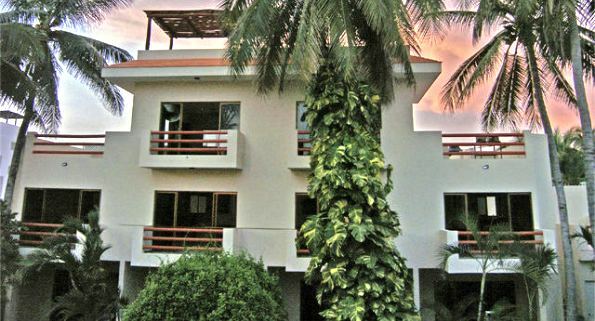 Situated half a block from white sand beaches that stretch for 14 kilometers, surrounded by restaurants and shopping, the Hotel Palmeras is a short walk to all amenities. Hotel Palmeras is a quiet serene hotel with 21 comfortable suites situated around a large sparkling pool with sun deck and lush gardens. All of the existing suites have been newly renovated and have an authentic Mexican decor with the comfort of North American amenities. Choose from a broad range of suites to suit your needs... from studio suites for up to three people to two bedroom suites that sleep up to five people with one bathroom. Some suites can be connected to create a two bedroom unit for up to six people with two bathrooms. Most suites overlook our heated pool and have fully equipped kitchens. Our Penthouse suites have gorgeous ocean views. 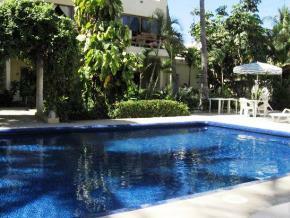 Hotel Palmeras has everything you are looking for to vacation in comfort under the warm sun of Mexico. ** All suites have connecting doors for added options. For a small fee we offer discounted long distance calls, currency exchange, beach equipment rental, and a convenient store for all your emergency needs. Hotel Palmeras offers discounts for longer stays and special rates for groups as well as very low rates for the low season period. What is the rate for two for one week in early February? wanting to reserve a suite?? We are coming to Bucerias on Nov 14 and plan to stay one or two nights. Do you have a quiet king suite available for two guests, preferably with a balcony/patio? Please tell us the current rate. We stayed at this Hotel for 10 days and had a wonderful time. All the staff were enjoyable to talk to and the owner was very friendly. I highly recomend this hotel to anyone wanting a real Mexican vacation.